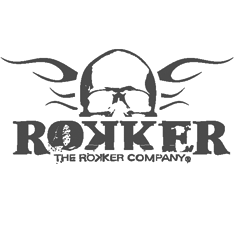 From the get-go Rokker has been impressing us with their state-of-the-art products. When it comes to safety and durability, Rokker just took it to the next level: the much-anticipated Rokkertech Slim jeans have finally arrived. These jeans are constructed from ultra-high-molecular-weight-polyethylene (UHMWPE, because that rolls off the tongue a little better...) with fibres twice the strength of steel. The cotton is woven around these UHMWPE cores, meaning Rokker managed to cram a whole lot of abrasion resistance in a single-layered jean. The Rokkertech jeans are lighter, more comfortable and still stronger than most comparable protective jeans on the market. Making them an ideal fit for all-day use, even after you park the bike. Pockets for optional knee and hip armour are of course incorporated in the design.